We move a fully-equipped caravan between coastal campsites for your accommodation. You benefit from a private, familiar base with all the logistics looked after by us. Your tour can be tailored to suit you. Clients self-cater. A shopping service is included in the straightforward price. "All I needed to do was lock the front door in one location in the morning, and unlock it in a new one in the evening." Milky, turquoise seas of Crozon. Plage de Théolen, West Finistère itinerary. The Brittany coast path, or sentier côtier, is a real gem for walkers. It's long; over 1700 kms, following Brittany's coast on an ancient path established for customers officers. Also referred to as le sentier des douaniers - recalling its origin - the coast path gives walkers unique access to a dramatic coastline renowned throughout France for its beauty, variety and unforgettable colour. Brittany enjoys a mild, maritime climate, near perfect for comfortable walking; and it's quiet. The length of the GR34 and a low population density, make crowding scarce. Andrew Eames, writer, sampling sanssacados. Article published 22/06/18 Financial Times. Click on photo for link to A Eames. We can accommodate up to 2 people in our caravan, but the Brittany coast path is the ideal place for a single's walking holiday. A safe, peaceful place to walk, with us looking after the logistics. Walking alone is a great way to experience a landscape. But come with a friend, walk as a couple; all are welcome and we'll be in the background to help. We can cater for larger parties, but extra guests would be under canvas. South Finistère's rias provide quiet moorings in a landscape constantly changing with the tides. Hidden away beaches and beautifully coloured sea characterize much of the Bretagne coast. Crozon itinerary. Base camp, sanssacados at Port Manec'h. Our solution to the thin spread of traditional accommodation on the Brittany coast path is a completely equipped caravan fitted with a quality, king-sized, double mattress. We move the caravan to the next coastal campsite whilst you walk. We provide everything you'd expect in an established camp: windbreaks, awning, outside furniture, wifi, electric hook up, bikes, barbecue (with fuel), full kitchen facilities, bedding and towels. Everything will be set up for you with your shopping done and in the fridge. Campsites offer perhaps the best accommodation solution for walking the Breton coast, with enviable locations often bordering the GR34 coast path. ​​Using our caravan and the coastal campsites eliminates the need for unpacking every day and the ferrying inland to B&Bs, maintaining the pleasure of being right by the sea. In the evenings you'll be able to take a stroll on the beach, watch the sun set over the sea, explore further on the bikes we provide, or have a dip. Approaching L'ile Vierge. Crozon itinerary. Walk for a month. It's possible! 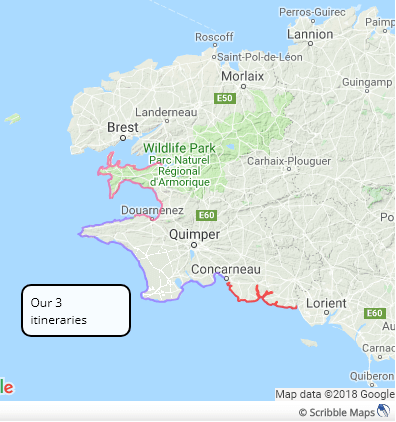 Our three itineraries allow a continuous walk, with planned camps, from Quimperlé, in the south of Finistère, to Landévennec on the Crozon peninsula. 25 days or a whole month's walking (if you added a few rest-days), covering a wonderful and varied section of Brittany's coast. Our first itinerary is for 7 nights along one of our favourite stretches, from the border of Finistère to Concarneau, the often overlooked, south coast of Finistère with its beautiful, wooded rias, turquoise seas and sheltered, sandy beaches. The second, starting at Concarneau, takes you to west Finistère. Out into the wild Atlantic along Cap Sizun and around the Point du Raz. The whole itinerary taking at least 11 nights. Although a sample of this itinerary can be enjoyed in a week. The third ​explores the unique, colourful Crozon Peninsula with its remarkably contrasting west and east facing aspects. Again, this is a suggestion for 7 nights. Our itineraries are suggestions which can be tailored to suit you. We will introduce additional itineraries with accurate distances and suitable campsites as we complete them ourselves. Ideas for adapting our itineraries, that we receive or that occur to us, will be featured in blog posts such as Cycling and Walking. ​Don't wait for us. The Brittany Walks website, the two books "Walking the Brittany Coast" published by Red Dog books and the Topo-guides will all prove invaluable if you wish to plan your own adventure. Following the coast path is generally easy, but it's nice to know where you are and what you are passing. So we provide the relevant IGN 1:25000 Série Bleue maps (France's equivalent of the OS Pathfinder maps) which you can carry with you. If you wish to purchase maps, we list which ones are needed at the start of each itinerary's page and they can be found at the IGN website. ​Alternatively, each daily description on an itinerary's page has a link, "See the walk on a map" this takes you to the relevant map's page on our site. Or find each day's map listed under Maps/Les cartes in the top menu bar. These maps can be zoomed in and out and show the routes right up to the campsites. Better still, at the bottom of each map on this site is a text link, or on the newer routes a button, inviting you use the Viewranger app. This button, or a text link opens the route in Viewranger. Viewranger is a free app. which turns a smart phone into a sophisticated GPS device. You can download Viewranger here. It will allow you to follow the route and your phone's GPS will show you exactly where you are on the map. No internet connection is required after the map has been downloaded. A further enhancement to the digital wizardry is achieved by purchasing the right to download all the IGN Série Bleue maps (and others) for France for about 22€ a year. This can be done through the Viewranger app, or from the Apple or Google play store where it's called iphiGéNie. You can then see exactly where you are and where the route goes on the best walkers' maps in France. If you are walking without our services, most but not all of the campsites are shown on the Série Bleue maps. Using the maps on our site, especially through the Viewranger app. should allow you to find them all. Feel free to contact us if you have any questions. Leaving Port Manec'h heading for l'Anse de Rospico. S Finistère itinerary. Whilst you hike Brittany's coast path, what do we do? We only cater for one group at a time. We tow the caravan with our Eriba campervan, which neatly provides our accommodation. We stay on the same campsite as you, but you have your own pitch and privacy. We deal with all the admin. So you arrive at camp and relax. We set up your camp at the next campsite each day. This includes a classic Dutch caravan, full kitchen facilities, an awning, outside furniture, a barbecue (including the charcoal) and all the equipment you'd expect in a well-planned camp. We provide all bedding and towels, including beach towels. We will do food shopping for you as well as laundry and collecting items from the pharmacy. Campsites are often in beautiful locations not necessarily convenient for shops. We can source organic and gluten free products. We help with reservations for restaurants and taxis, if required. ​If you feel happier knowing someone knows exactly where you are. Using a smart phone with GPS and the free app Viewranger. The "buddy beacon" feature will allow us to pinpoint your location. We provide WIFI, via a device which gives you a portable WIFI hotspot for up to 10 devices. This uses the provider with the best local coverage and, included in our pricing, comes with 1GB of data allowance (about sufficient for 2000 emails). Should you require more capacity an additional 1GB costs €10. We provide 2 bicycles (plus helmets, lock and high viz) for exploring or fetching baguettes. Please note bicycles are not allowed on much of the GR34 coast path. If you prefer, we can transport your own bikes (2 bikes maximum). What's the coast path like underfoot? Between Le Pouldu and Doëlan. S Finistère itinerary. View towards Pointe de St Hernot, Crozon itinerary. Le Cap de la Chèvre, Crozon itinerary. Rest day (extra days at same campsite) deduct €30. Extra guests, under canvas, email us for quote. Prices based on a minimum of 3 nights. We have no standard start day. ​Under cover, private parking is included if you are doing our itinerary. The campsites' and therefore our season is short in Brittany, usually 1st May to mid-September. Camping costs are included in the costs quoted. Food, laundry costs and taxis you may choose to use are not included. If entitled, you should ensure your European health insurance card (EHIC) is up to date. This gives you the same reimbursements as a French citizen, in some cases only 70% of the costs; you must, therefore, ensure you have separate, personal travel insurance cover. A 10% deposit will secure the dates you want. Payment can be in pounds or Euros. If you pay in pounds we will apply the current exchange rate. ​We will email you a PayPal invoice, or you can pay by bank transfer. Our south Finistère itinerary is conveniently accessed by the TGV. Trains from Rennes to Quimperlé run regularly and take about 1 hour and 45 minutes. At Concarneau, you are a brief taxi ride from Rosporden which is on the same TGV line. The journey to Rennes taking about 2 hours. The Crozon has no stations, but SNCF run buses from Quimper which is on the same line. If you are a foot passenger on the St Malo ferries, trains from there connect at Rennes. Rennes has flights from many international destinations, including many from the UK. Flights are also available to Dinard in the north of Brittany, near St Malo, from London Stanstead. A limited summer service may be available to Brest in Finistère from Birmingham or Southampton. If you come by car to walk our itineraries we can arrange parking; the cost of which is included in the daily price. Crozon is 50 miles from Roscoff and 150 from St Malo. Le Pouldu is 100 miles from Roscoff and 130 from St Malo. Fuel is most often sold at supermarkets with service stations something of a rarity. Please be aware that last year the speed limit was reduced from 90 to 80 km/hr on roads with no central reservation. View across l'Anse de Dinan, Crozon Peninsula.